In its 20 years of existence, City Theater Company has established itself as a top provider of live theater in Wilmington, while staying just as edgy and cool as it was when it was a burgeoning company. It still calls Opera Delaware's tiny Black Box Theater (one of my personal favorite theater spaces) home. I remember my first visit to a CTC show at the Black Box in the '90s -- I'd recently moved back to Delaware from Philly, the show was Assassins, if I recall, and it was the show that convinced me that you really don't have to go to the big city to see the kind of intimate, offbeat theater that excited me. It was a pretty big deal. In the past few years, it's been rare that I've missed a CTC show. Remember Reckless? Cruel, Calm and Neglected? Bloody Bloody Andrew Jackson, Bat Boy and Xanadu? Good times. 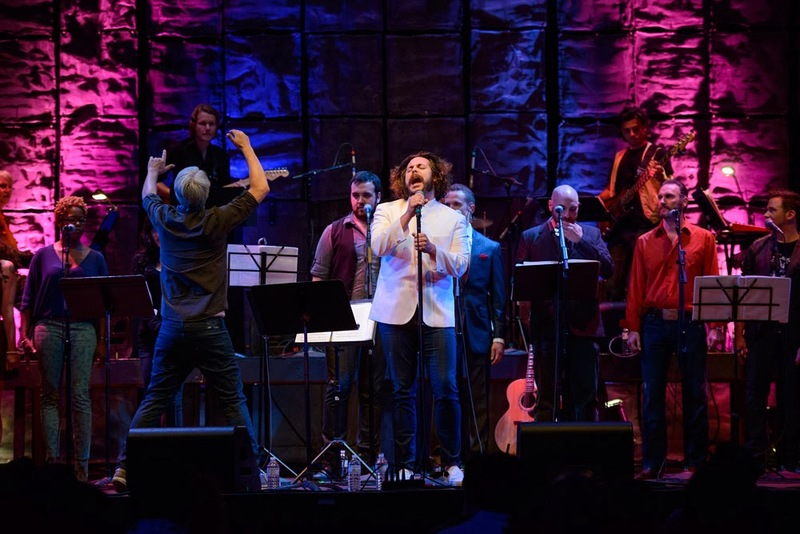 For its 20th birthday CTC decided to go big: a birthday celebration and fundraiser concert at World Cafe Live at the Queen, featuring Andrew Lloyd Weber and Tim Rice's epic 1970 rock opera concept album Jesus Christ Superstar in its entirety. Having spent my own slightly-past 20th birthday this year with Ted Neeley (who played Jesus in the 1973 film and on stage for decades) in concert at Delaware Theater Company, I was not about to miss this. CTC's special Superstar live concert was produced and conducted by Joe Trainor, who also -- get this -- sang the part of Judas. Simultaneously. Judas, if you don't know, is the lead, along with Jesus. As soon as I saw Righteous Jolly's name in the lineup in the promo materials, I knew he was going to be Jesus, and I knew he was going to pull it off. CTC fans will remember that Jolly played Andrew Jackson in Bloody Bloody. As Jesus, he stayed in character, bringing the presence the part demands, even as a concert. The remaining parts, many of which have featured solos, were filled by some of the best local talent, including CTC regulars Kerry Kristine in the female lead role of Mary Magdalene, Adam Wahlberg as Pilate, T.S. Baynes as Simon, Steven Weatherman as Herod, Lew Indellini as Annas, Frank Schierloh and Troy Shaeffer as Priests, and Bill Wilmore, whose bass delivery of Caiaphas was as good as any I've ever heard. The Chorus, made up of Dylan Geringer, Petra Deluca, Emma Orr, Clayton Stacey, and Dana Michael did a standout job, too -- you can't underestimate the importance of a good chorus. Along with a tight 5-piece band, Trainor's production was everything I'd hoped it would be. The only bad thing? It was a one-night-only-event. I'd see it again, no question. The good news is, Season 20 starts up in December, with CTC's version of Gypsy, followed by The Best of 2.0 Ten-Minute Play showcase, and Bomb-itty of Errors in the spring. For more information, go to city-theater.org.